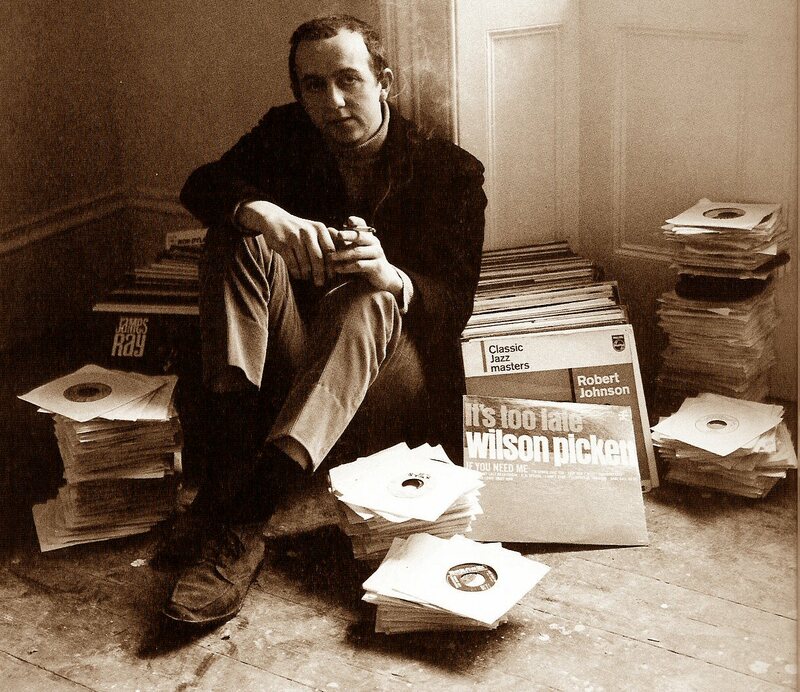 Sue Records UK was a subsidiary of Island Records and was founded by Chris Blackwell and Guy Stevens in 1963. The first issue, WI 301, was ‘Mockingbird’ by Inez and Charlie Foxx. 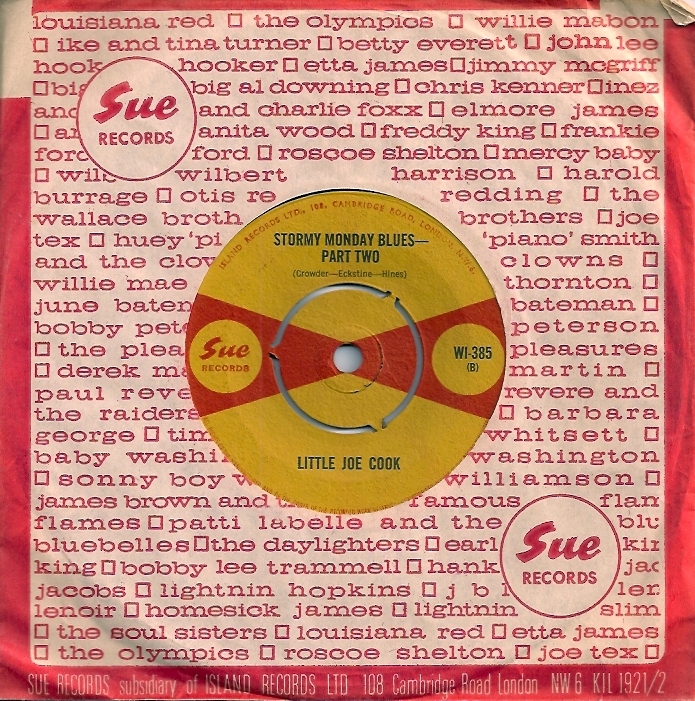 The first few releases were all sourced from Juggy Murray’s Sue records of New York. Gradually records were leased from other American record companies. 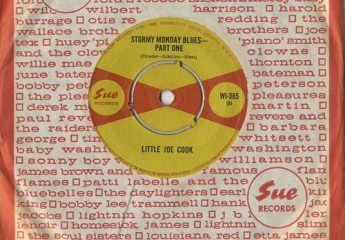 The records were snapped up by collectors of soul, blues and rock and roll music and were much sought-after. …arguably the most collectable series of discs on a single label. This website commenced on 30th October 2011 and hopes to include all music issued on the Sue UK label including the Island, Ensign and Kent issues. Island’s former address 108 Cambridge Road is now the site of a large block of apartments. Hello. I have enjoyed looking through this site, which I have just discovered today. Sue has been my favourite UK label for many years and I have had the pleasure of contributing to a couple of reissue projects reviving the label’s music. May I offer a couple of comments? The Big Mama Thornton single was recorded in California in 1965. The lead singer of The Anglos was Joe Webster, not Jimmy Miller. 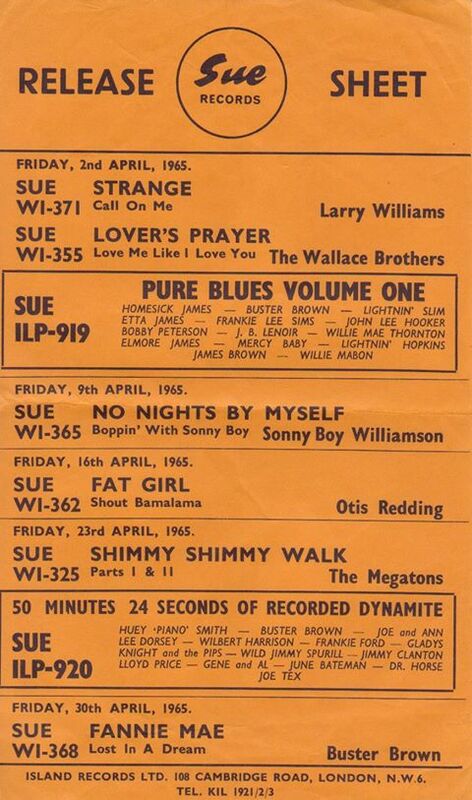 From its beginning, the UK Sue label was the major source of my intro to a whole world of rock, soul and R&B back in the 60s. I am forever grateful to DJ Mike Raven for pointing me to the label and a big thanks to you and your site for flying the flag too. Can I offer my support in creating the first ever UK Sue appreciation meet. I am sure there are many of us out there and would love to bring together the many collectors, experts and enthusiasts. Ideally it could be located in the UK (although i know live in NY now) but would love to travel to such an event. It could combine with a possible swap meet, auction and guest speakers. Just a thought and hopefully this idea may gain traction. Something a bit like it happened in London last September – a gathering of former Island employees, some of whom stretched back to the Sue days, in what used to be their after-work local pub in West London. I was lucky to be invited along as a guest. There used to be a Sue Appreciation Society, based at 13, Grantock Road, somewhere in East London, but that was a long time ago. You may be surprised yet – https://www.facebook.com/The-Sue-Appreciation-Society-281221241910793/ ! We read that the label was named after founder Henry Juggy Murray’s mother. Anybody here that knows where the Sue logo (the little child and the stars) originated from? Hello Benny, thanks for the information! Does anyone know? I believe that Sue was Juggy Murray’s daughter and that she had a birth mark on her cheek, which her father thoughtfully included in the logo. I was told that maybe 30 years ago but I can’t remember by whom. Thanks Mike. Can anyone else add any more information, please? John Powney, RIP, whom I met in the early eighties, by which time he had amassed a collection comprising 35,000 singles covering Doo Wop, R&B, Northern and Deep Soul and who possessed a phenomenal amount of knowledge, prior to the existence of the internet told me that the label was named after Juggy’s eldest daughter who interestingly was named after Juggy’s mother confirming both Benny and Mike’s information. John also said the logo was meant to represent Juggy ‘s daughter. I did read in a short biography somewhere that the daughter had a birthmark on her cheek roughly shaped like a star and this was why Juggy decided to incorporate this into the logo. It was John who introduced me, and many others to both the American and British Sue labels and who helped me to obtain many of the Sue singles currently in my collection. Thank you very much Dave (and Paul and Mike! ), it is highly appreciated, great story.